It’s officially time to plan your summer fun. 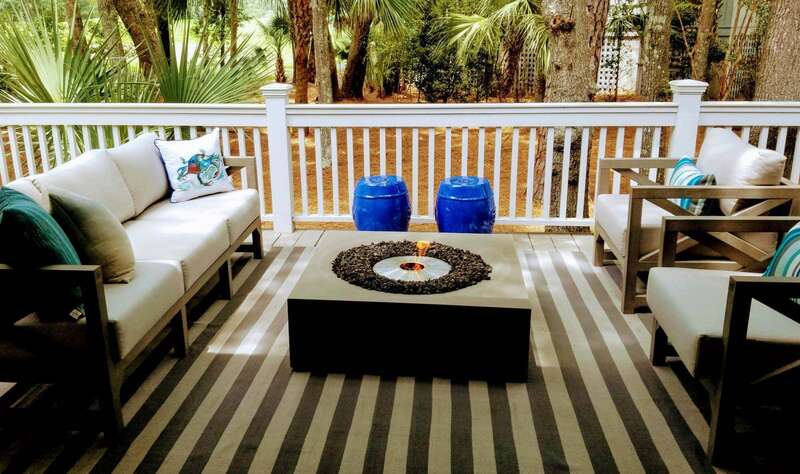 Here’s some good news for those vacationing on our barrier island: Kiawah Island events abound! Best of all, there really is something for everyone, from active adventures to eco-friendly explorations and wildlife encounters the whole family can enjoy. Read on to learn about can’t-miss Kiawah Island events this summer. Enjoy a close encounter with South Carolina’s iconic marine mammal, the dolphin, as you explore inlets, creeks, and marshes in search of the resident pod. 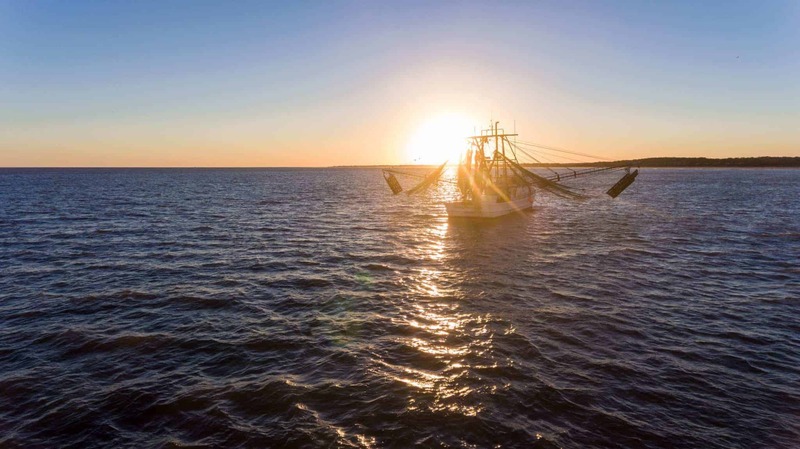 Set sail with local favorite seafarer Captain Jack right out of Bohicket Marina. Book your private tour for up to six in advance by calling (843) 343-1772. Each Wednesday night from June 13 through August 15, you can catch today’s favorites and classic, kid-friendly flicks beneath twinkling skies — free of charge. 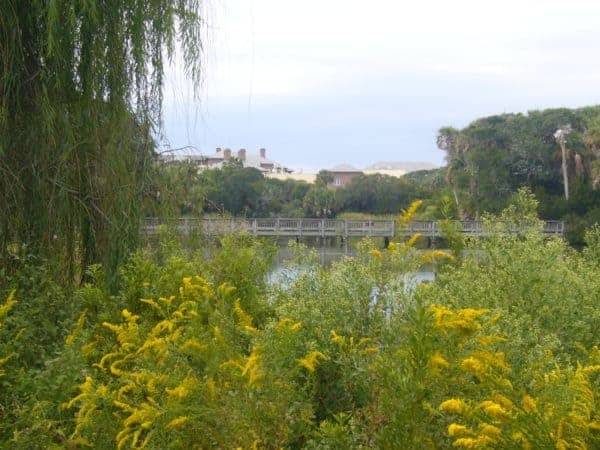 This Kiawah Island event takes place at Freshfields Village from 8:30pm-10:30pm. Remember to bring beach chairs and blankets! 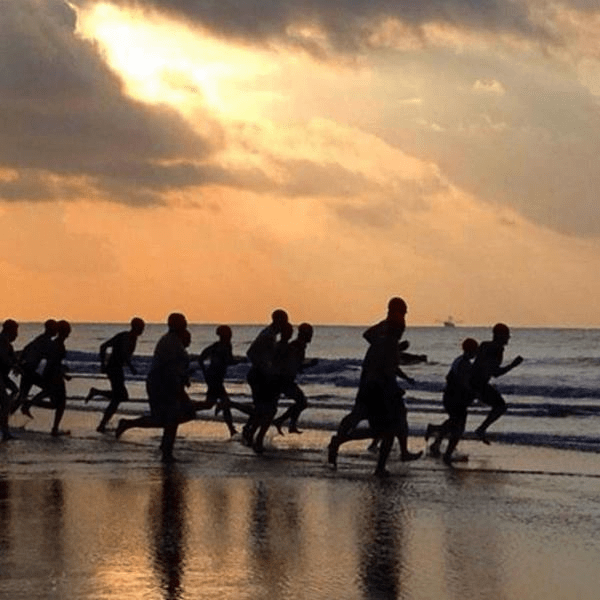 Squeeze in an intense, 45-minute workout right on the sand during a boot camp-style workout intended to build strength while torching calories. It costs $18 per person and is recommended for those age 13 and up. Reservations are required and can be made by calling (843) 768-6001. Each Friday from 6pm-9pm throughout the summer, make your way to Music on the Green, a complimentary music festival at Freshfields Village where you can spread out a blanket and listen to bands from the barrier islands and beyond play under the night sky. Each Monday from 4pm-6pm, Freshfields Village hosts a weekly farmer’s market. 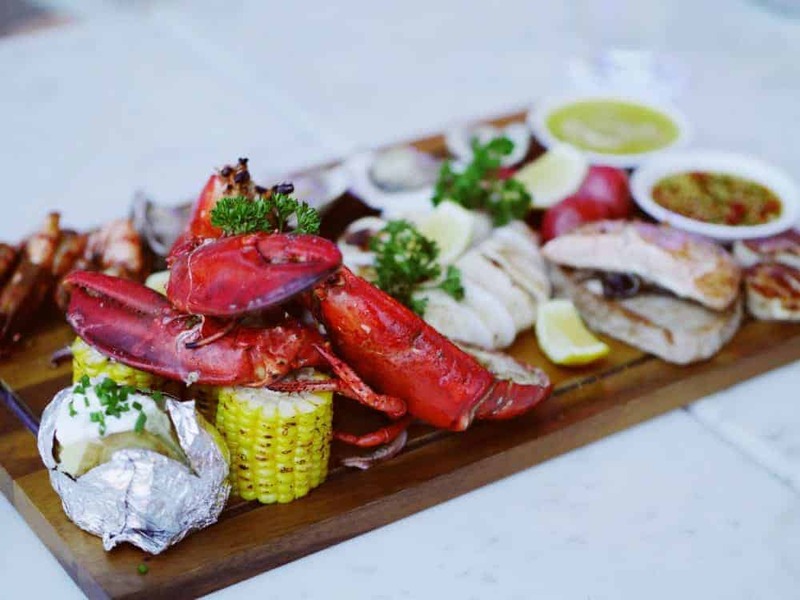 Browse the specialty foods, fresh-caught seafood and Lowcountry crafts, or grab a BBQ dinner or sweet treat to enjoy back at your villa. Or venture less than a half hour away from Kiawah and enjoy other nearby and hugely popular farmer’s markets. On Saturday morning on John’s Island and Sunday morning on James Island, local farmers and vendors peddle everything from produce to home goods. Enjoy food trucks at the John’s Island market and live music at the market on James Island. Cast a line out over sandbars, wrecks, and artificial reefs to catch native Kiawah Island fish including redfish and black sea bass. 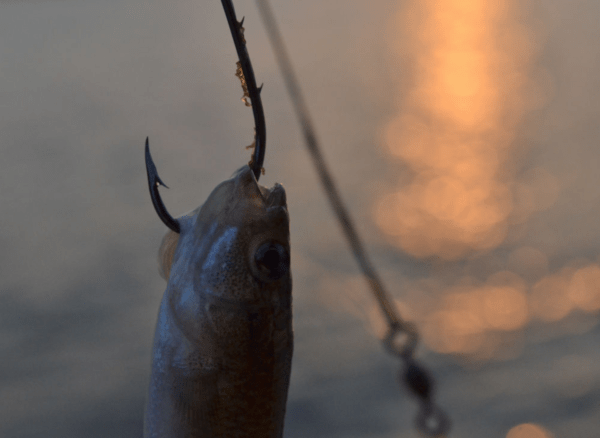 These daily fishing charters are open to both families and seasoned anglers, so bring the whole crew and see what you can reel in for dinner. A single party of up to four costs $650, while five to six rings in at $750. For more details, information, swing by the Heron Park Nature Center or call (843) 768-6001. Ever wished you could catch a shark? Make your dreams come true on a shark-fishing adventure that sets sail from Bohicket Marina. From makos to tiger sharks, you’ll have the chance to get up close and personal with a variety of species. Custom charters start at $250 for 2 hours. Learn more here. Tweens and early teens just wanna have fun — sometimes without their parents in tow. That’s where Kiawah Adventure camp comes in. Slotted for 8:30am-4pm the week of August 8, it features everything from disc golf, atlatl and pool games on Monday to paintball on Thursdays. Call (843) 768-6001 to reserve their spot. Have a younger camper in tow, or visiting a different week? 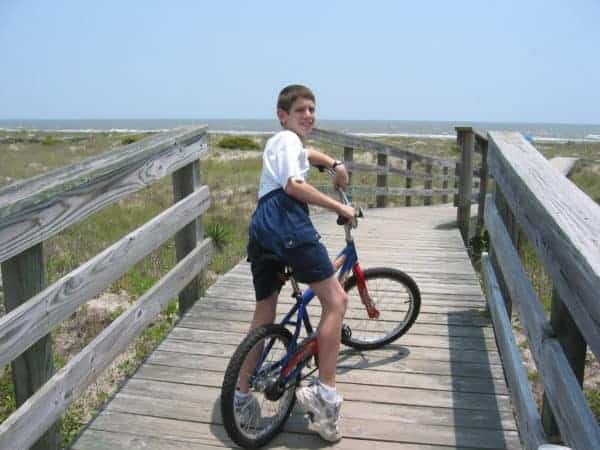 Kamp Kiawah offers kid-friendly options for fun on the island all summer long. Learn more in our post about the top family-friendly things to do on Kiawah Island. Get to know Kiawah Island’s landscape and fascinating wildlife from a different vantage point: on your bike. Pedal through dunes, salt marshes, forests, and more while learning about the diverse plant and animal life that calls Kiawah Island home. The cost is $20 per person, not including bike rental. The minimum age is 10. Call (843) 768-6001. Score freshly barbecued oysters as the sun sets over the Kiawah River at Mingo Point Oyster Roast and Barbecue, a scenic, communal — not to mention tasty — gathering that’s not to be missed. At this beloved Kiawah Island event, there’s a kid’s zone, craft market and naturalists on hand, too. The event — held Monday evenings at 5:30pm, 6:15pm, 7pm and 7:45pm through August 27 — costs $49.95 for adults and $25.95 for children ages five to 12. Additionally, there’s a river cruise that costs $20 per person. Advance reservations are recommended. Call (843) 768-2121. Ready to book your stay? Check out our pitch-perfect Kiawah Island accommodations, which range from luxurious, beachfront villas with panoramic ocean views, to welcoming getaways surrounded by marshland. Family vacations are a fine art. If you spend too much time lounging at the beach, the kids will get antsy. Jam pack your days with active pursuits, and you might leave feeling more tired than when you arrived. 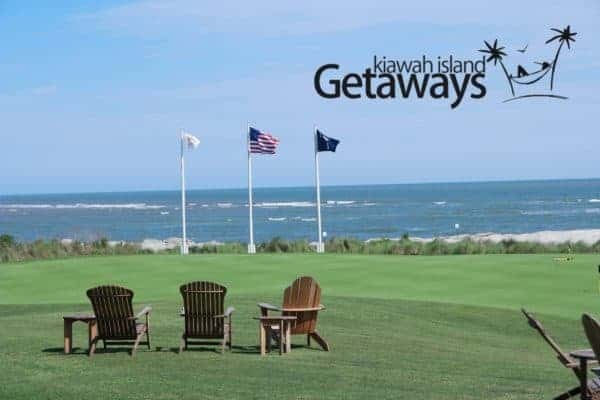 But with its bike paths and marshes, scenic parks, and kid-friendly activities, Kiawah Island offers the ideal setting for an all-ages getaway. Here, you’ll strike the perfect balance between fun and relaxation. 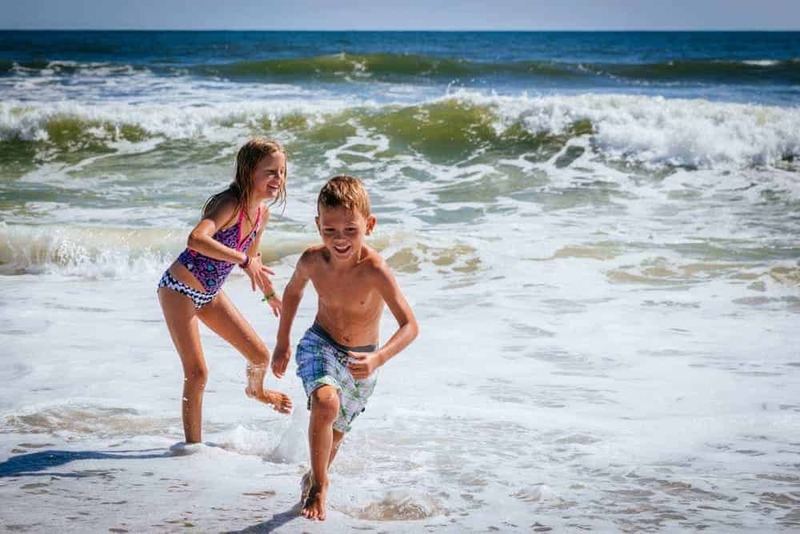 As a family ourselves, we’ve done plenty of firsthand research on the best things to do on Kiawah Island, for kids from young to old. So if you’re searching for ideas on how to spend your time as a family on Kiawah, look no further. Here are our ten favorites. Cast a line in a Kiawah river. Book a fishing tour with your tiny anglers. Let the little ones cast their lines in Kiawah’s channels and creeks and reel in some prize catches. Or if you’d rather stay on land, grab a bucket of bait and head to the island’s fishing lagoons or the pond at Night Heron Park. 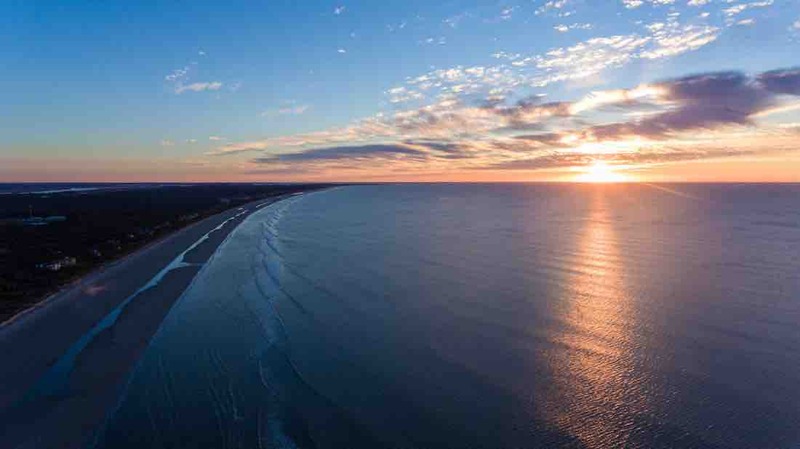 With 10 miles of beach, Kiawah is a haven for water-lovers. We recommend heading to Beachwalker Park if you’re planning on doing some serious swimming: lifeguards are on duty there during the season. Or if you’re seeking a little more excitement, bring the family to the Splash Zone at nearby James Island County Park. Let the kids zoom through the waterslides while you meander down the lazy river. 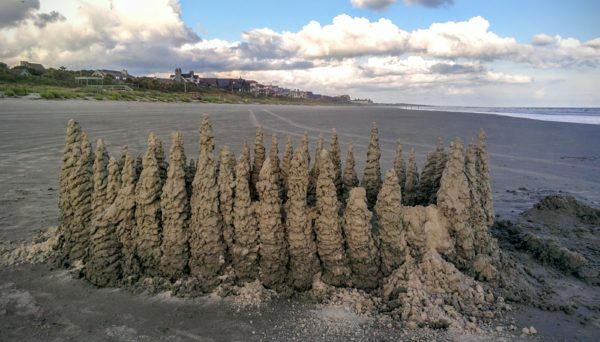 Look at the beach and you’ll see the proof—building sandcastles is one of the islanders’ favorite things to do on Kiawah Island. With smooth, compact beaches, you’ll have an excellent base— and an array seashells offer plenty of options for decoration. Team up or face-off individually to see which of your kin can craft the best castle. It’s classic, simple beach fun. Book a family tee time. Have a budding pro on your hands? Osprey, Cougar, Turtle, and Oak Points all offer family tee times in the summer and around the Christmas and Easter holidays. No hole is longer than 250 yards, and tee times are spaced out for a low-pressure environment. Book with ease by calling (843) 266-4050. Part method-of-travel, part fun, riding the bike paths is among the top things to do on Kiawah Island. Get in a workout and let the little ones burn off some energy by riding all around the island. Pedal past lagoons, scenic marshes, the beach, Freshfields Village, and Bohicket Marina—where you can window shop as the boats pass by or dine at a mouthwatering Mexican restaurant. When you’re not sure how to spend your day, just start pedaling: you’re bound to find something to keep the troops entertained. 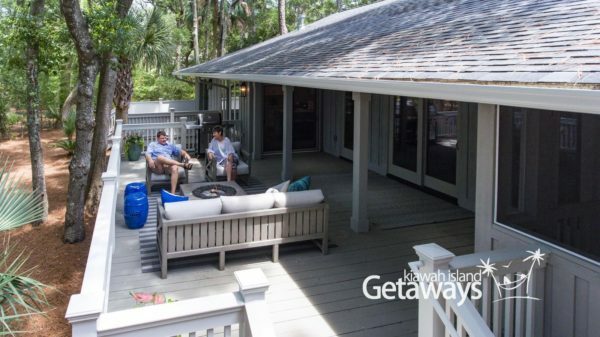 Spend the day at Kamp Kiawah. 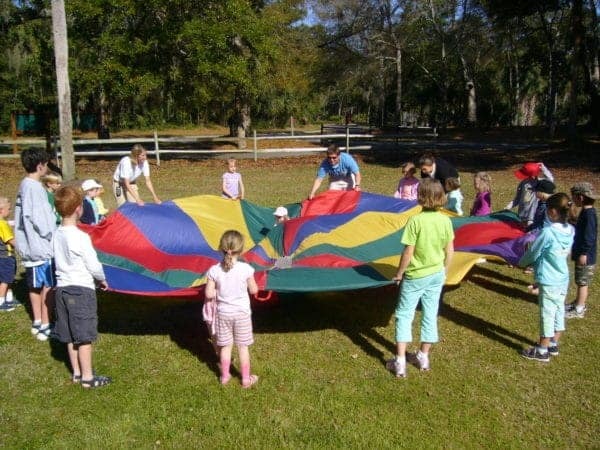 Sign the kids up for a morning, afternoon, or full day at Kamp Kiawah, a favorite among young guests on the island. They can choose between classic camp fun—like arts and crafts and swimming—and faster-paced theme camps with activities like kayaking, motorboat trips, and Ninja Warrior courses. Plus, while they’re having a blast at camp, you can treat yourself to an afternoon at the spa or on the green. Book a day at camp by calling (843) 768-6001. See what’s happening at Mingo Point. Mingo Point’s Oyster Roast and BBQ is a longstanding favorite thing to do on Kiawah Island. But this scenic spot is home to more than the famous cookout. Visit during the day to catch dolphin encounters tours, family kayaking groups, and more. For a rundown of the day’s activities and to make reservation in advance, call (843) 768-6001. Go on a wildlife scavenger hunt. From egrets and pelicans to bobcats and alligators to the beloved loggerhead turtle, Kiawah’s lagoons, marshes, and forests are home to a vast variety of wildlife. Set out on a day-long scavenger hunt to see who can spot more of the island’s native creatures. For a little bit of help, catch a daytime or nighttime naturalist tour out of Night Heron Park. Find the best ice cream on Kiawah. No day on the island is complete without a sweet treat. Try a new spot every night to find your favorite cone—you’re on vacation, after all. Taste seasonal scoops at The Sanctuary’s Beaches and Cream, order the famous vacation sundae at old-timey Vincent’s Drug Store, or save room for dessert at any one of Kiawah’s mouthwatering restaurants. Make a splash at the movies. Every Thursday night in the summer, The Sanctuary opens up its pool for a very special Kiawah Island tradition: dive-in movies. Grab a poolside lounger or cool off with a dip while family-friendly flicks play on the big screen by the pool. Where else can you watch a movie under the stars, with the waves rolling in in the distance? 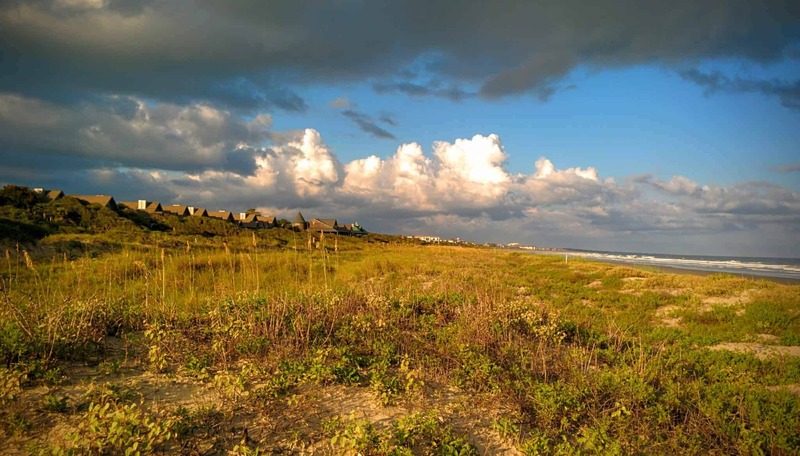 Find family-friendly accommodations near the top things to do on Kiawah Island. Choose accommodations with room for the whole family to rest, relax, and enjoy vacation to its fullest. 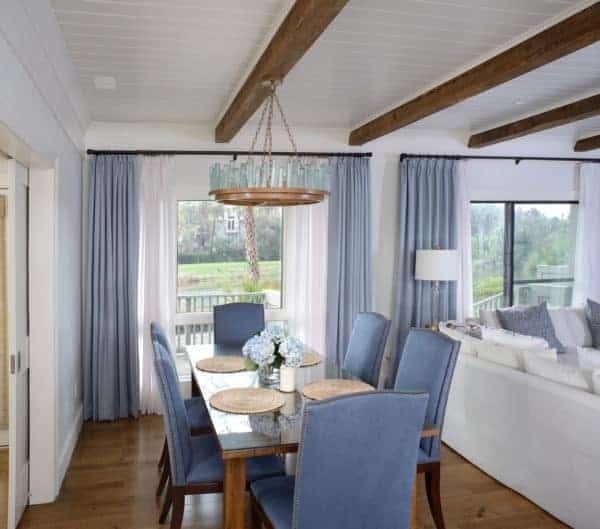 Our Kiawah Island villas offer spacious bedrooms—many configured to accommodate small families—and indoor and outdoor living areas, ideal for spending time together. Learn more and book here. 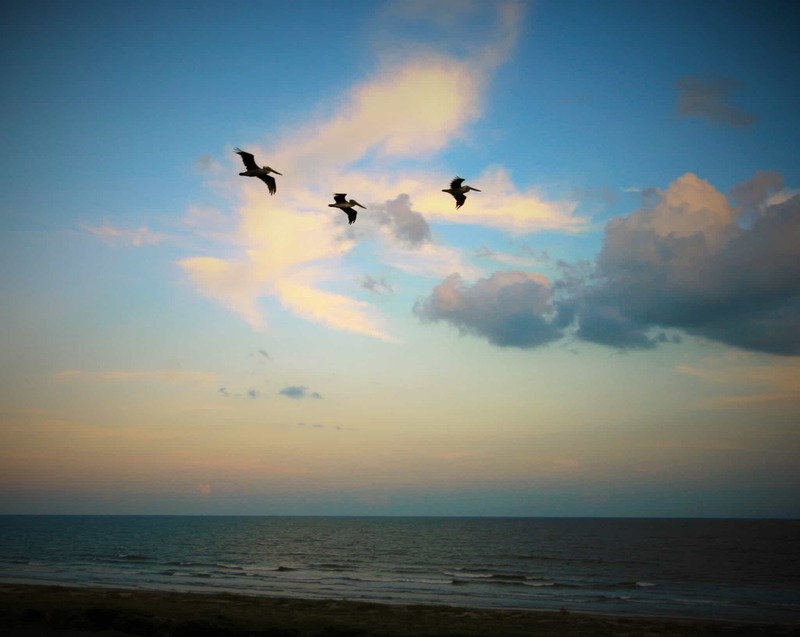 What’s the best way to see Kiawah Island? By pedaling around with sand beneath your tires and an ocean breeze in your hair, of course. We’ve created a map of the best bike trails on Kiawah Island, where you’ll find everything from treks along the shoreline to journeys to local oyster cookouts. But with so many great options, how do you know which trip to choose? We hope you’ll spend enough time on the island to enjoy them all! 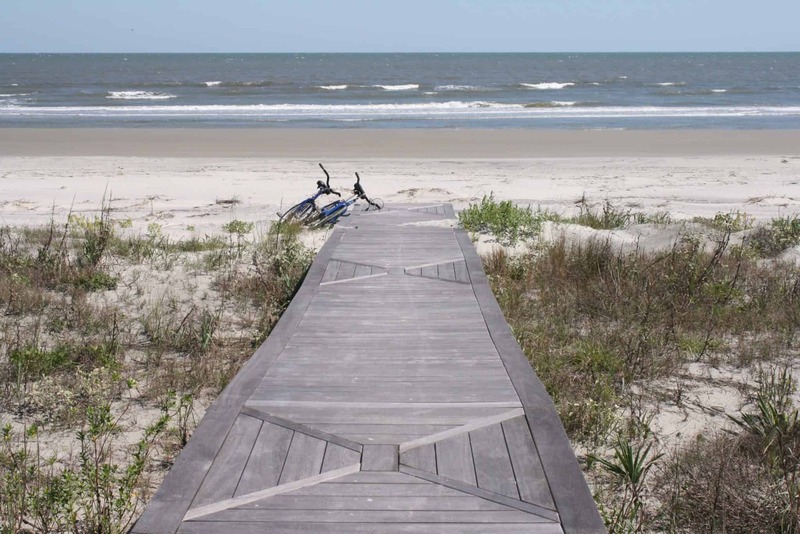 But if you’re looking to narrow down your options, we’ve put together a guide to the best bike trails on Kiawah Island for each personality. Whether you love watching coastal birds cut across the sky or prefer mingling with the locals, there’s a trail that’s guaranteed to be worth your time. Dolphins, alligators, river otters, deer—there’s a whole population of winged, finned, and four-legged creatures that you can spot when you hit the bike trails on Kiawah Island. Set out on the beach in the morning or late afternoon and ride straight down the hard-packed sand to the east end. Stop along the way to dip your toes in tide pools and herd minnows with your feet as they dart back and forth in schools. Once you’ve reach the soft sand on tip of the island, walk your bike to the waters and keep an eye out for wildlife. Or bike to Captain Sam’s Inlet on the west end to watch dolphins play where the river meets the ocean. If you’re lucky, you may even catch sight of one fishing in the shallow surf. See wildlife flying high and slinking deep when you pedal around Night Heron Park. Listen for the song of the loggerhead shrike or look to the skies to catch sight of the cheerful yellow pine warbler or iridescent tree swallow. Glance out across the pond and you’re bound to see tall herons wading and even alligators swishing their way through the waters. Seeking the most scenic spots on the island to impress your Instagram followers? Or just want to experience Mother Nature’s handiwork? Then Eagle Point is a must-visit. It’s one of our favorite spots on the island for its quiet serenity and sweeping views. Pedal out to the open marsh and catch glimpses across the greenery all the way to Cooper River Bridge. Can’t get enough of the wetland views? Pack lunch and ride bikes over to Mingo Point, where you can dig in at picnic tables with panoramic lowcountry views, or go for a spin down the Kiawah Island Parkway, over the Kiawah River and into Rhett’s Bluff to take in scenes of the marsh and Bass Pond. And then, of course, there’s the marsh towers. These tucked-away viewpoints soar over 30 feet skywards so you can see the island from a birds-eye view. Ride the trails at Cougar Point to the Marsh View Tour, or pedal along Marsh Island Park (off Governor’s Drive in Vanderhorst) to find the Marsh Island Park Tower. 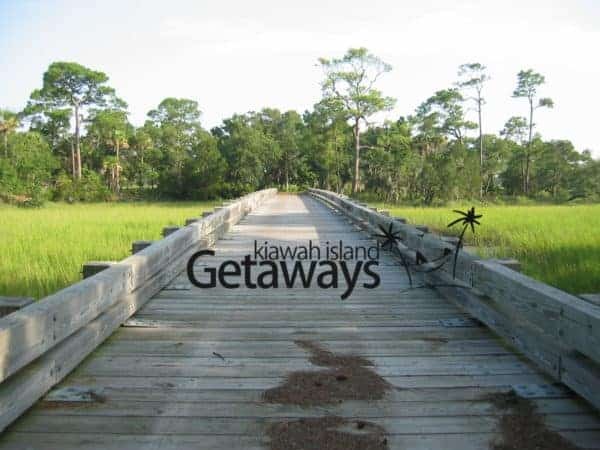 For most, hitting the bike trails on Kiawah Island is all about reconnecting with nature. But for some, it’s a social experience. For those people-people, we recommend pedaling from the guardhouse to Freshfields Shopping Village, where you can grab a bite to eat, shop the boutiques, and even catch spirit tastings, jazz nights, and meditation workshops. Keep following the path, beyond the village towards Seabrook Island and you’ll find Bohicket Marina. Stop to watch the boats sail by or dine on fresh caught fish (and don’t forget to grab an ice cream cone to fuel your journey home). Foodies can also earn their meal by riding out to Mingo Point on Monday nights in the summer, when locals and visitors alike gather for a traditional lowcountry oyster roast and BBQ. Bring the kids and a little extra cash: you’ll find naturalist demonstrations, local merchants, and a design-your-own beach bag station to visit after you’ve finished chowing down. You’ll need a reservation to attend: call 843.768.2121 to save your spot. Rather indulge in a liquid lunch? Ride past unique shingle-style architecture to the Ocean Course Clubhouse, where you can reward yourself with a cold drink and panoramic ocean views at the Ryder Cup Bar. 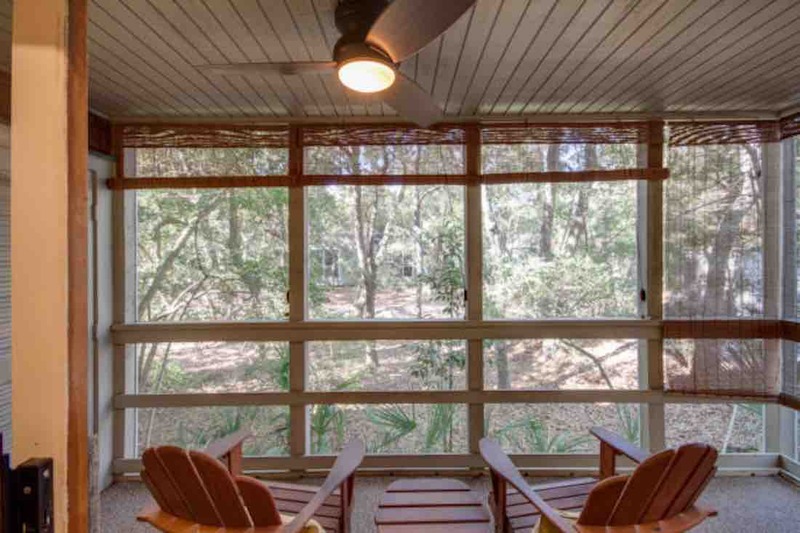 After a long day on the trail, come home to a cottage, penthouse, or condo with scenic views of the ocean or wetlands. 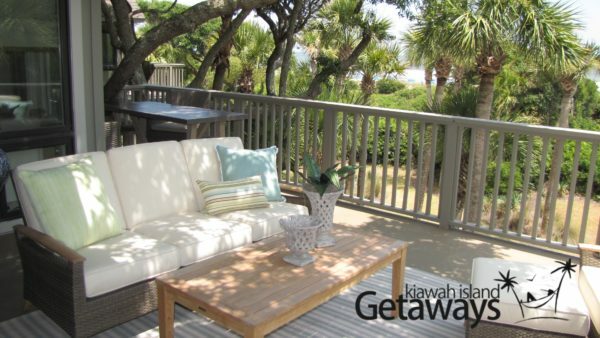 See where our vacation rentals are located in relation to your favorite trail, or check out our full offering of luxury accommodations on Kiawah Island. I always enjoy strolling Kiawah Island’s beach with Shawn as the day winds down and the sun is setting. Shawn and I generally walk from Shipwatch along the beach until we reach Mariners Watch. Then we turn around. It is fun to watch the families as they pack up their chairs, beach towels, coolers and bags, slowly draw the children away from the waves and start heading back to their villas to prepare for dinner. 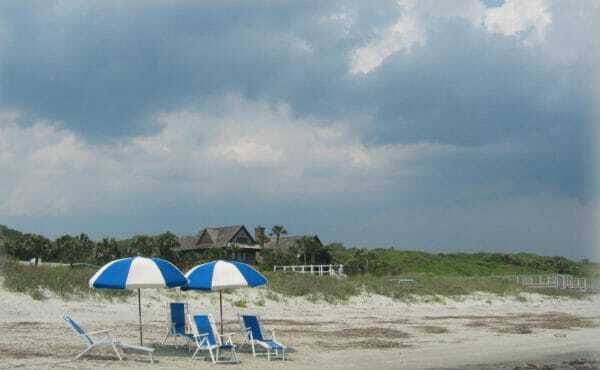 We talk about the day’s accomplishments, (or as is the case at Kiawah, our lack of accomplishments), we talk about our family, the houses that we see along the way, interactions with our latest guests. And as we walk, Shawn splish-splashes through the waves, which always results in me wearing wet pants. Of course, I have learned (ever since that fateful July 4th, many years ago) to hand over my cell phone to Shawn (they don’t work too well after a dip in the salty water!). My oldest son, Benjamin, taking photos the beach. We walk with the wind in our faces, the sun setting behind us. I am always reminded of our Kiawah photographer who has taken so many photos of our family on the beach – he calls the time between 7 PM and 8 PM in the summer, the “Golden Hour”, which is the ideal time to take photos on the beach. 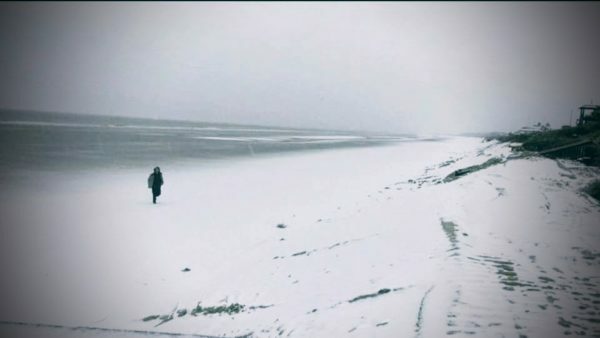 And as I walk with Shawn, I too take photos – not of people, at least not most of the time, but of the beach, of the shells on the beach, the birds, and of the incredibly colorful, wide-open and ever-amazing cloudscapes. 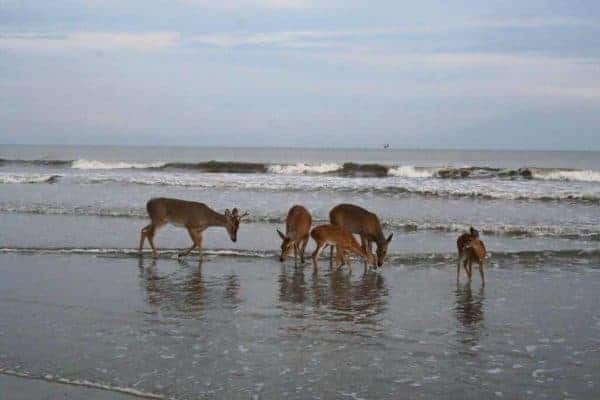 And if I am lucky, I will spot a rainbow over the ocean, or a small herd of deer on the beach. Of course photography is simply a hobby for me – and capturing that perfect image is illusive, always taunting me to take more. So please enjoy my collection of Kiawah photos. And maybe some evening, as the sun is going down, we’ll stroll past each other on the beach, cameras in hand. This is a fun simple thing to do with kids or when acting like a kid yourself. Take a box of saltines, or an old loaf of bread to the beach and have fun feeding the sea gulls! For extra fun – try feeding them a big red apple! The birds will almost eat right from your hands. It is soo much fun to do – and what a way to bring the nature right to you!! This is a MUST SEE when you are visiting Kiawah. Located just off the island (near McDonald’s) is the largest tree East of the Mississippi. Angel Oak is believed to be in excess of 1500 years old, its massive, draping limbs and wide spreading canopy present the aura of an angel but the naming of this tree was acquired from the tree’s previous owners, Martha and Justin Angel.